Kisdon Force is a series of waterfalls in a wooded gorge on the River Swale in beautiful Swaledale, one of the most scenic of the Yorkshire Dales. 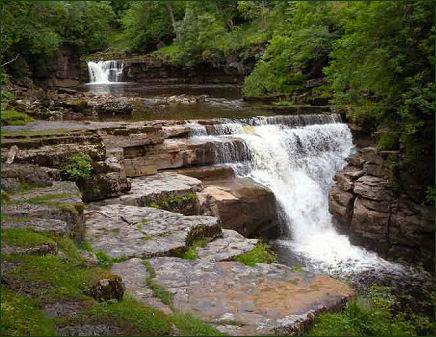 The falls are situated 500 metres downstream from the small village of Keld. Kisdon Force is one of several waterfalls on the River Swale in the vicinity of Keld area, the others being East Gill Force, Catrake Force and Wain Wath Force. All occur where the river cuts a gorge through the limestone between the hills of Kisdon and Rogan's Seat. The falls in this area are known as forces which derives from Norse word fors or foss, which means waterfall. The falls drop 10 metres (33 feet) over two cascades and are surrounded by Kisdon Force Woods, a Site of Special Scientific Interest covering an area of 38 hectares, which consists of mixed broad-leaved woodland with ash, wych elm and rowan trees dominating. In the springtime Primula vulgaris grows profusely in the area. 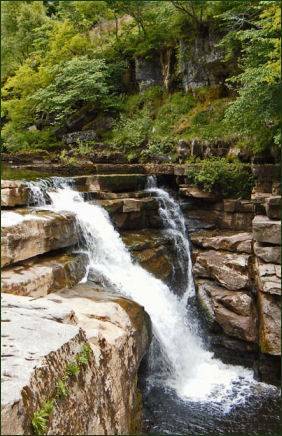 The falls can be reached by a riverside path from Keld; however, care should be taken, as the stones around the falls are often wet and slippery. Visitor numbers to the falls are swelled by walkers along the Pennine Way, a long-distance footpath that passes the falls on its way north. Park in Keld village and follow the Pennine Way north crossing the river Swale by footbridge, 50m beyond the bridge turn right and follow the track on the north side of the valley that runs parallel to the river.